My new OFF-GRID retirement place! It’s been a while since I’ve posted. I’ve still been doing DIY consulting, but all my spare time has been going in to the new house. Yup, it’s OFF-GRID, even though power is available. I’ve always wanted to do this, and this was my last chance to do so. If it flops, I can always connect to the street and have a great backup system! To start off, this first picture is the “power wall”. 2 boxes at left serve the house and garage. 3rd grey box is a “future use” primary input breaker box that goes through the wall to a meter, and down into conduit that goes under the driveway to the hillside. Wires are already installed, so if someone in the future wants street power, they can have the power company excavate from the hillside without tearing up the parking pad. 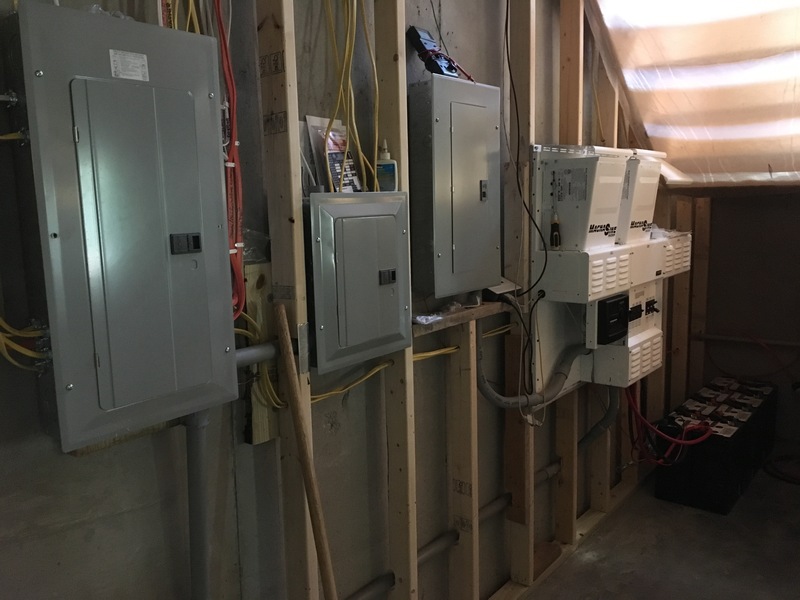 From there, conduit feeds into the main switching area on the triple Magnum inverter (which only has 2 MSPAE4448 inverters mounted at the present time for 9KW of power), and then on to the MAIN breaker panel at the far left. Moving to the roof, I’ve got 28 280 watt panels for 7840 watts in an ideal world. There are 14 Magnum GT500 dual micro-inverters up here that directly convert the DC voltage into 240 volts AC. There are two strings of 14 panels, and each string goes back to a 2 pole 20A breaker in the main panel. This provides both an AC back-feed into the battery inverter to charge the batteries AND at the same time provides any excess power from the sun DIRECTLY to the appliances. So on sunny days, we can do the laundry, running the washer and dryer at the same time without discharging the battery bank at all! This is dramatically different than a traditional off-grid setup with panels, charge controller, batterybank and battery inverter. The traditional setup means the power is limited by the size of the inverter. If my batteries are fully charged, I can draw 14KW (3 X 4.4kw) plus the 6KW from the panels for a total of almost 20KW around noon on a sunny day! With my system 14 panels is a perfect match for 1 bank UB 638oov batteries that have 380AH capacity. Since I have 28 panels, I will also have a 2nd battery bank in parallel. Thus, a PERFECT matchup in terms of charging power. This also gives a daily (overnight) discharge of about 15%, which babies the battery bank and will allow for a full 10 year lifespan. The bank is fully charged (in normal sunlight) by 1PM each day. The panels are PERC type, and also do well on grey days, producing about 2800 watts reaching full charge before sundown even in winter. If we have too many dark days, there is a plug in option on my outside wall to connect our generator to fully recharge a 50% battery bank in about 4 hours. 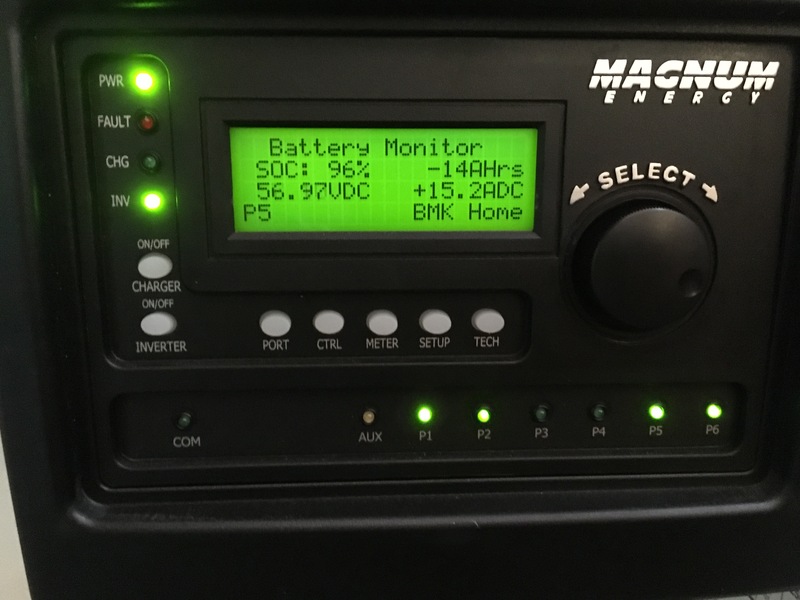 The Magnum ME-RTR Router does a nice job of controlling all three of the MSPAE-4448 battery inverters, and allows fine tuning the BULK, ABSORB and FLOAT voltages to suit whatever battery type you have. This is CRITICAL if you want to maximize the battery life by applying the proper charge regime that the manufacturer recommends. The information display is very informative. I’ve also got a regular display that mounts upstairs where it’s more convenient to keep an eye on the system. It’s also connected to the local network for viewing on my home computer. Shows the same data. A Magnum MAGWEB is also connected to put the data onto my local network. For those of you who noticed the 4 larger panels at the far end of the roof, those are german made 4X8 solar THERMAL panels that will heat water inside a 100 gallon storage tank. This gets circulated through a maze of 1/2 inch pex tubing embedded in 1 1/2 inches of Gypsum-concrete on the main floor providing solar radiant floor heating when needed. Each of the 4 rooms on the main floor has it’s own thermostat as well as a branch in the basement where it is converted to hot air. We’ve bought a small piece of Heaven on Lake Keowee in South Carolina and have begun the process of building our retirement home there. It will be a long process and we expect to relocate from Cincinnati sometime in mid to late 2018. In the meantime, I will still be taking care of my many Cincinnati clients both old and new, and nothing will change in the immediate future. Long distance work East of the Mississippi will continue on the same basis as before. 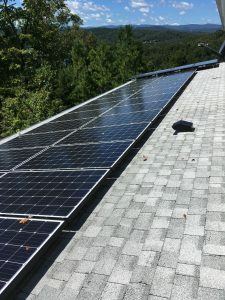 With panel pricing now below 50 cents/watt for even name brand panels, and inverter prices falling as well, it’s not uncommon to come in around $1.35/watt complete for roof mounted grid-tie systems (before the 30% tax incentive!) so SOLAR is more affordable than ever before. This is now a 5 to 6 year payback! If you’re interested in a DIY Solar project, and you live East of the Mississippi, or anywhere around Lake Keowee, look me up and I’ll be glad to help you save a bundle on grid tie, grid backup, or even off-grid DIY SOLAR PROJECTS!